Are you thinking of using wallpaper in a bathroom? With the continued popularity of wallpaper in homes, bathrooms are the most popular request we receive for wallpaper installations. How about you? Have you considered a wallpaper installation in your bathroom or powder room? 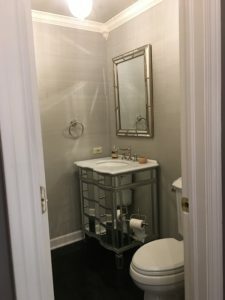 A small powder room with grasscloth wallpaper installed. Can I wallpaper my bathroom without it peeling? The short answer is yes! Wallpaper has come a long way in the past 10 years. Why? Wallpapers are constructed of more sturdier materials. The wall materials (drywall) is made much better than it used to be. Wall primers that are used to seal the walls create a surface that is exceptional to hang wallpaper on. These primers will make sure that moisture does not penetrate the drywall and keeps the wallpaper adhered to the primer- not the walls. What does all of that mean to you? It means that the wallpaper when properly installed will not peel from your bathroom walls! Installing wallpaper in a bathroom is Economical! Powder rooms and bathrooms are usually much smaller that other rooms of your house. This means less wall space. Less wallspace means less wallpaper is needed to cover the walls. How do you select wallpaper for your your bathroom? If you are in the chicagoland area- go to JC licht. They have great designers who can help you pick the right wallpaper. Be mindfull of the width of the wallpaper- wider the paper the less rolls you need. Here is wallpaper installed above wainscotting. 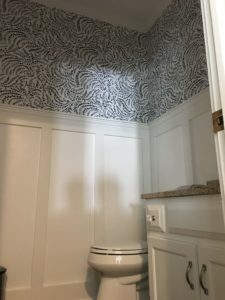 Do you have questions about wallpaper installations in your bathroom? Please let us know. We want to be able to help you and asnswer your questions. Most importantly, we want you to love the space your in! 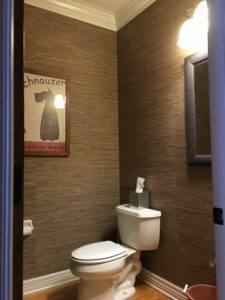 Still not sure or have questions about wallpaper installations? How much does it cost to wallpaper a room?